CRISM scene FRT0000B5A3 covers the southern wall of Gale crater, 15 km downslope from the rim. This region is gently sloping, compared to the northern wall, potentially indicating that the Gale basement rocks in the crater rim are mantled by newer material. A fluvial channel also bisects this scene. Fe/Mg phyllosilicates (green) have been exhumed by the central impact crater in this scene. This morphological feature along with the material inside the smaller crater toward the northwest are correlated to mass wasting events in this region of Gale Crater. The Mars Science Laboratory (MSL) Curiosity Rover is investigating the layered materials that make up the large mountain in the middle of Gale Crater. 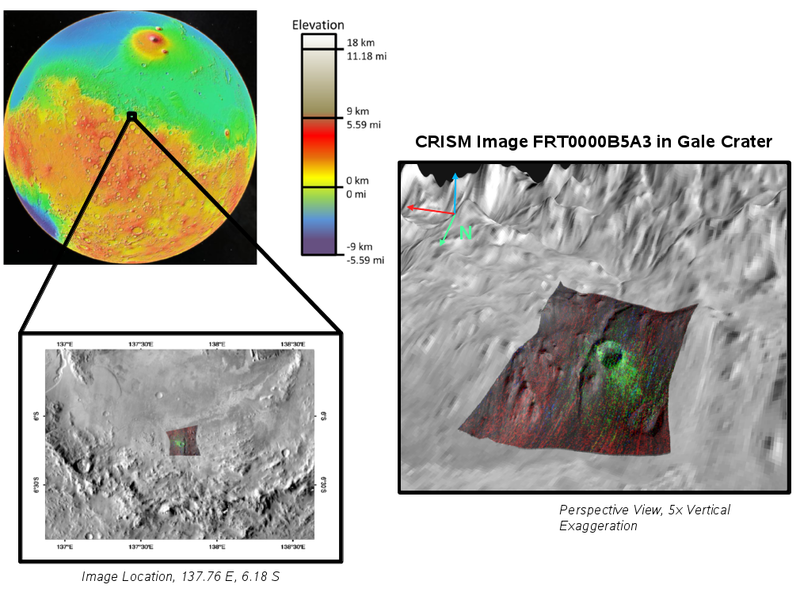 The Compact Reconnaissance Imaging Spectrometer for Mars (CRISM) is one of six science instruments on NASA's Mars Reconnaissance Orbiter. Led by The Johns Hopkins University Applied Physics Laboratory, the CRISM team includes expertise from universities, government agencies and small businesses in the United States and abroad. CRISM's mission: Find the spectral fingerprints of aqueous and hydrothermal deposits and map the geology, composition and stratigraphy of surface features. The instrument also tracks seasonal variations in dust and ice aerosols in the Martian atmosphere, and water content in surface materials — leading to new understanding of the climate.